View More In Detective & Spy. Microscopes are widely used in education, lab research, biology, metallurgy, engineering, chemistry, manufacturing, and in the medical, forensic science, and veterinary industries. Beginner compound microscope provides with high magnification for educational purpose. 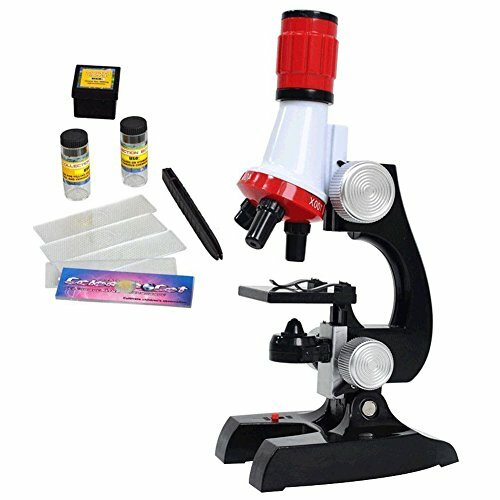 This beginner microscope kit, forward-facing rotating turret with 100x, 400x and 1200x magnifications refined stereo science scientific instrument toy set, is quite sturdy for a starter kit. This magnification set actually allows children to see quite a bit. Absolutely an ideal gift to arouse children' s interest to explore the nature. 1. Open the batteries compartment door after unscrewing the protecting screw. 2. Insert two AA batteries, as directed in the compartment's bottom. 3. Put back the protecting screw. 4. Lift the nose piece as much as possible with the upper wheel. 5. Put a slide with the tissue or organism you want to observe on the tray, fixed under the two blockers. 6. Point the light up, and switch it on. 7. Set the sharpness with the upper wheel, and adjust the eyepiece to your eyesight by turning it gently. 8. Adjust the light intensity with the lower wheel. Too much light can crush some low contrast details. 9. Be careful, when going from the smallest to the largest magnification, lift the tube to avoid hitting the tray. Please do not look down at the eyepiece with LED light on when there's nothing on the stage. Educational Microscope Kit encourages scientific exploration and discovery, introduces a key scientific tool in a fun way. Super educational toy includes everything necessary for a child to be introduced to science and get started dissecting specimens. Monocular viewing head with LED. Comes with multi-piece accessory kit; Ideal microscope for home, school or for students. Requires 2AA batteries (Not including). Great gift for 3 years up kids boys girls and students to arouse their interest to explore natural. If you have any questions about this product by Regilt, contact us by completing and submitting the form below. If you are looking for a specif part number, please include it with your message.